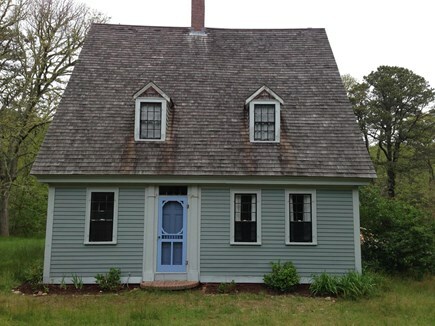 Classic Cape house but with raised roof for full second floor. 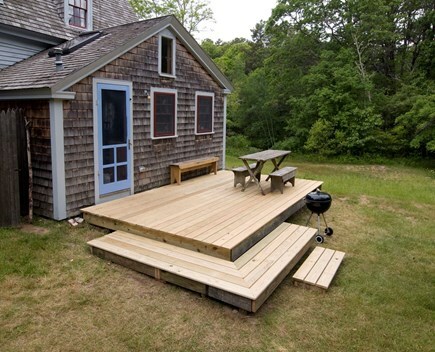 Deck outside dining room, great for lunches. 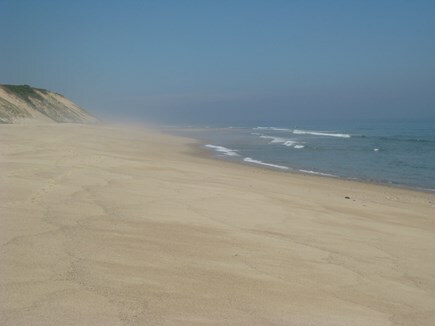 Sand road leads to beach, a walk past four visible ponds. Horseleech Pond- awful name, great swimming! A 15/20-minute comfortable walk puts you on this beach. 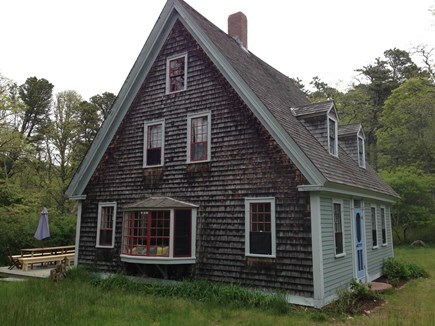 In the woods of Wellfleet, this original Cape house was rescued from ruin in the 1930's. 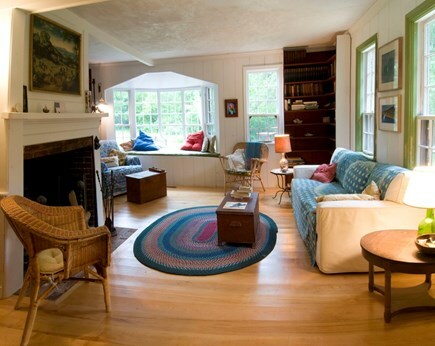 The house has been lovingly improved and is now a spacious home. 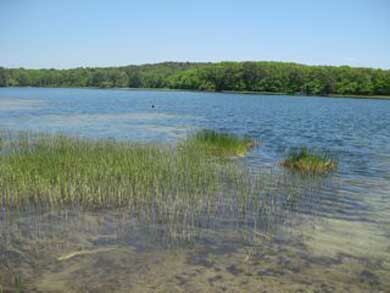 A relaxing walk along a path through woods takes you to Herring Pond. 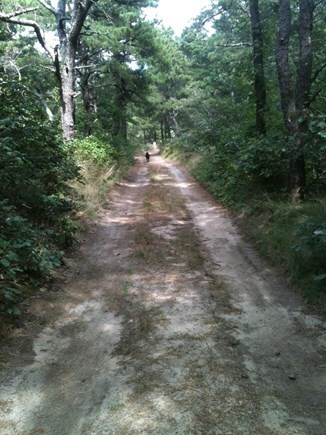 Continuing on the sand road you pass Slough Pond and Horseleech Pond to arrive at the beach! The beach (just north of Newcomb's Hollow) is, we think, the best ocean beach in the lower 48. The lawn, the hammock, the locust trees are perfect for a lazy summer afternoon with easy access to salt water and fresh water swimming. 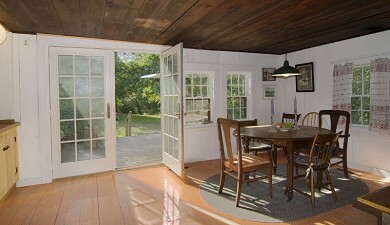 The kitchen and adjacent dining room are superb for large gatherings and multiple cooks. 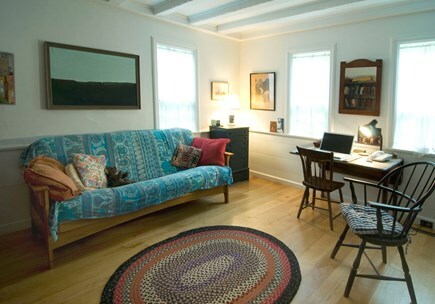 The house is 1/2 mile from Route 6 and 2 miles from Wellfleet Center--and the excellent public library. It sits on 4 1/2 acres in the National Seashore with no immediate neighbors. Four bedrooms -- two singles, one queen, and one double are on the second floor. The first floor study has a futon couch and can be comfortably used as a bedroom. 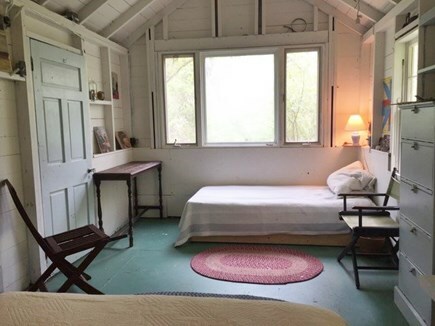 This room is right next to the downstairs full bathroom. 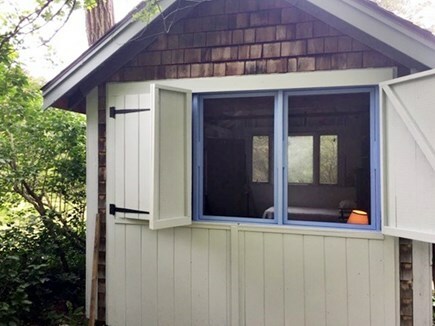 Outside, the original garage is now an private room with double bed and single bed. Perfect for a couple with a young child. The Herring River (actually a brook) flows past at the foot of the lawn. Polite dogs are welcome. Internet access is via MiFi cell tower. The speed is fine for email and internet browsing. Streaming is not a good idea. A truly lovely week, with the spirits of the house in attendance. Extraordinary to be here.. In such congenial silence. No other such place on earth. 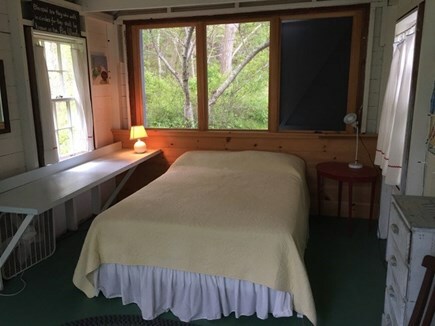 Tucked in the wood/Your gem of a home/Became our home for a week.../Again if we could - we HAPPILY would/Ramble and roam/swim, fish and seek [heart] We loved your home so much. Thank you for sharing and making memories for our families. 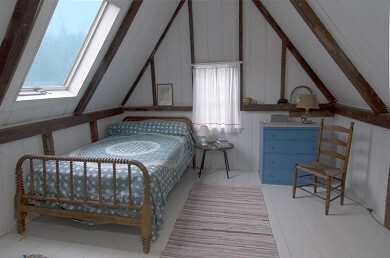 Another wonderful and relaxing time at the ''Cape House''. The four of us utilized all that was offered and more memories were made! IT just keeps getting better every year. Thank you. Thanks for sharing your beautiful home. We loved everything about our stay here. Saw deer, a coyote, a fox, lots of birds and rabbits and tons of frogs. Really enjoyed your books too-everyone four something good to read. Boys learned how to surf — Dad made blueberry muffins and we ate a lot of seafood. Even the weather cooperated. 2 weeks of blue skies and good waves. Our dogs like sitting in the yard with no worries about traffic. It's hard to go home. Another great vacation. Don't change a thing! We had a perfect week at the Matson house. Stayed here with a family we know much better now. The weather cooperated beautifully. Our three boys loved playing together in the yard, on the beach, in multiple ponds, riding bikes on say back roads. Our dog love being outdoors all the time and a couple of hikes are still not our of the question givens she's 12. Thank you for sharing your house we us. We did have a perfect stay and can't wait to be back in this neck of the woods next summer. Additional availability info: If you can, take advantage of Sept. - best weather, best swimming, best price. This is a Saturday to Saturday vacation rental. Additional pricing info: Prices always negotiable for multiple weeks. State and local taxes of 12.45% will apply. First floor bedroom and full bath. Bathroom not wheelchair accessible. We have stayed in several houses along Black Pond Road - searching for the perfect house. This is it. It's secluded, set back from the road in its own clearing, with large lawns and trees surrounding it on all sides. 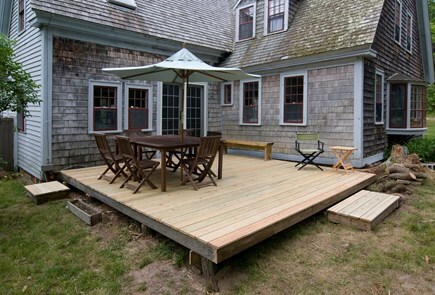 Two decks, on east and west sides of house for outdoor dining both morning and evening. A hammock and outdoor shower and a grill. 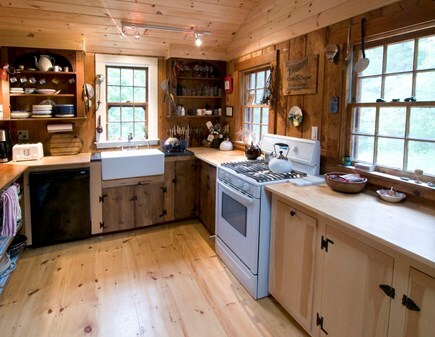 A large kitchen with everything you need and open dining area let's the whole crowd hang out and cook and talk. Once we arrive, we never put on our shoes but to drive to town to shop for dinner. It's a short walk along sand roads to all the ponds that you want to swim in: Herring, Slough, Horseleech, Higgins, Gull and Round. A little further takes you along a path to the ocean - but away from the crowds. Easy access to miles of sand roads and single track trails through the hollows and hillocks of the seashore.